This year’s Anglo American AGM – always very genteel affairs – was a little more exciting than usual. Mark Beacon of LMN member group ACTSA (Action for Southern Africa) presented Anglo American’s Chairman, Sir John Parker, with the ‘Golden Snail Award 2014’ during its AGM on 24 April for procrastinating over compensation for South African former mine workers dying of silicosis. The Chairman was a little taken aback by the award, and thanked ACTSA for it. But he repeated – at great length – the company’s position that it is not responsible for, and therefore not liable for, the fact that so many former gold miners from Anglo American group mines are dying of the disease. He said it was an industry-wide problem and Anglo American was working on industry-wide solutions. The miners were represented at the AGM by Senzeni Zokwana, President of the National Union of Mine Workers South Africa and Peter Bailey, the union’s Chair of Health and Safety. Senzeni used to work for AngloGold Ashanti, back in the days when it was owned by Anglo American. He pointed out that although litigation against Anglo American had brought relief to some of the former mine workers suffering from silicosis, many had died while waiting for a settlement. He called on the company to set up a trust fund, independently of the current litigation, to ensure that suffering former mine workers get the health care they need. Peter Bailey said he was very distressed by the company’s apparent lack of a sense of urgency while former mine workers were dying. It was spending money on defending itself in court instead of on supporting ill mine workers. Anglo American should lead the industry in establishing a trust fund. Others would follow, and litigation would then fall away. Company Chief Executive Mark Cutifani undertook to enable the NUM representatives to make this formal proposal to the South African Chamber of Mines. The NUM representatives judged this to be progress of a sort. We’ll have to see what happens. Several organisations in Brazil had asked London Mining Network to raise concerns about Anglo American’s Minas Rio iron ore project. Andy Whitmore said that local people have reported intimidation by armed security guards supposedly linked to the company. Would the company make sure it was not linked in any way to abuses by armed security? The answer to that was pure blether. The company works to the highest possible social and environmental standards, it is creating jobs and educating local young people… The very fact that it is obtaining the necessary permits shows that it is working to the highest standards. Richard Harkinson later asked about damage done by construction of a pipeline over 500 kilometres long to take ore from the mine to the new export port. Land acquisition agreements have not been completed. Would the company respect modified guidelines? Local people complained of disruption to their water supplies. How does the company act on people’s complaints? The answer was that water supplies were only disrupted for a few days. The company has now acquired all the land it needs for the pipeline. The proof that it is doing what it should do is that it is obtaining the necessary permits. Not much of a proof if local people question the efficacy of the permitting process. Edward Mason, representing the Church Commissioners and the Church of England’s Pensions Board, noted that Anglo American had received an ‘A’ rating from the Carbon Disclosure Project for its carbon emissions management. Would it continue to develop its carbon management so that it retains this ‘A’ rating? Would it call for public policy changes to ensure that atmospheric carbon emissions do not exceed a trillion tonnes? Well, maybe. The Chairman wants us to put our trust in technology. Anglo American mines platinum, platinum is used in catalytic converters. It mines copper, and copper is used in fuel cell technology. The company is calling on governments to support carbon capture and storage. So that’s alright, then. Alex Scrivener of LMN member group WDM spoke about the ‘carbon bubble’. We can only safely burn a small fraction of the world’s known coal, gas and oil deposits if we are to avoid catastrophic climate change. Coal deposits may well become ‘stranded assets’. Would the company pull out of coal? No, it wouldn’t. There is still a huge demand for coal. Three quarters of the new power stations being built in Asia are coal fired. But technological innovations like high temperature boilers and carbon capture and storage will overcome the problems. The world’s poor need coal generation. Alex pointed out that carbon capture and storage is a pipe dream. It is at least a generation away, and by then it will be too late to avoid catastrophic climate change. It is the poor who suffer most from climate change and coal mining; and much of Anglo American’s coal is sold to Europe. A representative of the Local Authority Pension Fund Forum, asked about the bitter dispute over pay at the company’s platinum mines in South Africa. The Chairman said he did not welcome strikes. (What a surprise!) Strikes hurt everyone including the workers, and while the company is not making any money, it is not paying taxes. Long strikes in British coal mines killed the British coal industry and he feared for the future of the South African platinum industry. Mark Cutifani added that 30,000 workers had now not received a pay cheque for twelve weeks. The future of the platinum industry depended on increased mechanisation, but there had to be a just transition strategy for communities reliant on jobs in the mines. Chris Griffith, CEO of Anglo American Platinum, said that the company wanted to raise pay levels but not to a level that meant it had to lay people off. This would be disastrous not only for platinum mining but for industry in South Africa in general. A representative of Share Action was concerned about the massive pay of company CEO Mark Cutifani compared to the pay of ordinary workers. Would the company support the establishment of a commission to look into conditions in the South African mining industry in the light of the Marikana massacre?The Chairman said the Board had no regrets about the CEO’s pay because he was adding so much value to the company. The CEO said the company would participate in any commission set up to look into ‘living wage’ levels in the industry in South Africa. With regard to relative salary levels, the issue is apparently ‘complex’ – a helpful way of avoiding straight answers on the issue. I was there representing LMN member group Colombia Solidarity Campaign. I pointed out that there were big problems with community relocations around the Cerrejon Coal mine in Colombia, of which Anglo American owns one third (along with BHP Billiton and Glencore Xstrata). The relocation of the village of Roche had only recently been completed, and those residents who had chosen – or felt pressured – to give up agriculture were having problems making a living in other ways. The company had provided assistance in establishing new livelihoods but people were apparently getting into difficulties when the period of assistance came to an end. Then there is the community of Tamaquitos: this relocation process was presented by the company as a ‘model’ relocation but residents complain of a lack of shade and too much wind, so their crops are suffering. What would Anglo American do to address these problems? I was told that the removals have been carried out according to International Finance Corporation standards. There are often difficulties in the early stages of a relocation, but the situation is monitored and will be evaluated after three years. Assistance with establishing new livelihoods has been contracted to an NGO. If it is not doing its job, the company must address this. I said that our contacts in the communities tell us that whenever we complain to the multinational owners in London, for a while local management start treating them better in Colombia. So the pressure on local management has to be constant. Graciela Romero from LMN member group War on Want spoke on behalf of FECODEMIGUA, the Federation of Communities Displaced by Mining in La Guajira (the area where the Cerrejon coal mine is). FECODEMIGUA represents several communities displaced in the early stages of mine construction at Cerrejon. The federation had sent us a Declaration to pass on to Anglo American at the AGM. It reminds the company that it is two years since FECODEMIGUA made a set of proposals to address the injustices which community members had been suffering since the early 1980s. Cerrejon Coal management had responded with meetings with low level officials and with ‘corporate social repsonsibility’ initiatives which were nothing more than public relations exercises. FECODEMIGUA needs to be taken seriously. It needs meetings with officials who have the power to make decisions. The Chairman said that people come and go and sometimes do not do the job that is expected of them. Graciela should speak to Jon Samuel and the new head of Coal, Seamus French, after the meeting. Graciela said that the company clearly did not wish to take responsibility: it has had FECODEMIGUA’s proposals for two years. The Chairman said that if she provided a note for his office they would follow up on this. 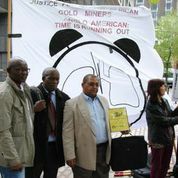 ACTSA presented the Golden Snail Award to Anglo American for delaying justice for former mine workers dying of silicosis. But the company deserves the award for other things as well: unsatisfactory handling of community complaints in Brazil; failure to realise that protecting the climate demands pulling out of coal; resisting demands for decent pay for its platinum mine workers; and dealing with community complaints in Colombia. On all these counts, it is a champion procrastinator – a worthy recipient of the award. Let’s hope that by next AGM it will have got its act together.